New luxury tented camp at Arebbusch Travel Lodge! We are delighted to announce the long-awaited opening of our luxury tented camp at Arebbusch Travel lodge. This exciting innovation is a one-of-a-kind experience for travellers seeking accommodation in Windhoek. Our tented camp offers a plush safari experience just steps away from all the luxuries of civilisation. Adding to our family-friendly portfolio of accommodation, our luxury tented camp is surrounded by ample space for children to play and explore among the beautiful gardens and indigenous vegetation of Arebbusch Travel Lodge. 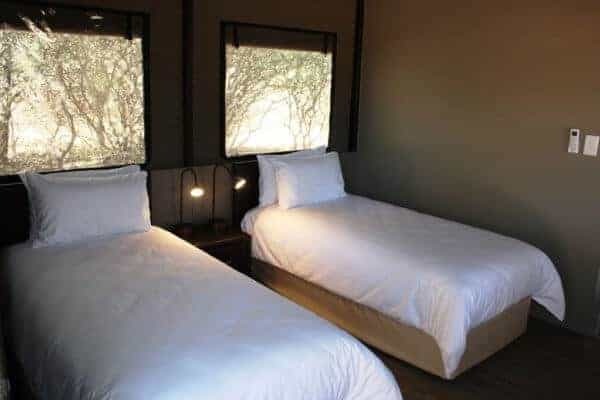 These meru-style tents are perfect for a stopover en-route to explorations further afield, or as a base to appreciate the many delights of the Windhoek surrounds. Book a shuttle service into Windhoek from Reception to make the most of local knowledge. While enjoying your luxury camping you can take advantage of all the lodge’s conveniences, including the option for a bed and breakfast stay. Please let us know whether you would like breakfast included in your accommodation rate when you do your booking. For your continental or buffet breakfast needs our excellent onsite restaurant is just a short walk away, and offers relaxed lunches and hearty evening meals. Should you choose to sample the nightlife, shopping, historic sites or entertainment on offer in Windhoek, a short trip along the B2 will take you there in no time. The spacious canvas-covered patio with table and chairs is perfect for secluded reflection among the typical bushveld vegetation surrounding the city, or for enjoying an evening braai in your private braai area. After a day of exertion and discovery, you can relax in air-conditioned comfort in your spacious 13.7m2 tent, which sleeps two people on comfortable beds with high-quality linen. A bedside table, reading lamps and ample shelving are provided for your convenience, as well as electricity and a separate plug for electronic devices. There is limited free Wi-Fi with top up vouchers available. Each tent has a private en-suite bathroom equipped with hot and cold water shower and basin, a toilet, mirror and fluffy bath towels. A scullery with counter space, a kettle, fridge and electric power points are provided among the outdoor living spaces and there is secure undercover parking right next to your tent. You will find our gorgeous swimming pool located close to the Reception area, where you can spend hours lapping up the Namibian sunshine, while the children enjoy our playground or games room. We invite you to try something new on your next visit to Windhoek. Get in touch to make a booking at our luxury tented camp and take advantage of our opening special – N$/ZAR 550.00 single per night and N$/ZAR 650.00 double per night. To book one of our Luxury Tents, either click on this link to book online or click on this link to complete our online inquiry form. Alternatively, call us on +264 61 252255.